A low weed seed bank is the primary essential for cropping profitability in this high cost-low margin farming era, so it’s a vital management area for most grain farms. Whatever the type of farming system in an individual enterprise, rotations are always of basic importance. Wide crop rotations with high stocking rates. Relatively high herbicide use in crop with alternating chemical groups. Confinement by narrow windrowing of harvest residue usually burnt, or placed and not burnt onto tramlines in controlled traffic farming (CTF). Mechanical seed destruction at harvest. Operation of a Chaff Cart at harvest. More than one of these options at various times on the same farm. Wider rotations (pasture for two or more consecutive seasons) can suit farms with substantial livestock numbers. Allows a relatively lower cost, lower risk enterprise and tends to give good weed control if seed set is well contained in Spring. e.g. Heavy stocking rate after spraytopping to limit chemical resistant plants setting seed. High herbicide use is common but has proven problematic if relied upon as the primary method of containment, as resistance is developed in many weed species, often after only several generations. New herbicide chemistry is rarely seen now with most new releases a mix of existing technology. Narrow windrow burning is cheap and effective if burning of rows can be done at optimum timing. This often proves difficult in practice due to weather constraints and if stubbles are grazed prior to burning windrows are sometimes broken, or heat generated is not sufficient to burn all seed. At least though, seed is restricted to a narrow band, not spread. This method is popular across many regions of Australia. Placing residue on tramlines in CTF is also gaining acceptance with good combine attachments now available for the job. Mechanical seed destruction at harvest appears close to being widely available but at high capital cost and significant maintenance cost. If proven practical for all crop types and conditions it will be an excellent option for total crop enterprises. Maybe not so much if sheep or cattle are in the system as the fragmented seeds are not accessible to animals. All material is returned to the soil as valuable humous. Chaff Carts were probably first used in Canada, with some units imported to Australia around fifty years ago then locally manufactured. Small capacity and unsuitability to Australian conditions meant limited acceptance. Carts have advanced on all levels with several good models available across Australia, reliable and with excellent capacity for modern large combines. Weed control capability of the cart is well established and the valuable feed reserve produced is considered a genuine additional reason to implement the system where stock are involved. Many cart owners have reduced or eliminated supplementary hand feeding over summer. Heaps are sometimes baled and removed but it is not common. Burning of heaps before seeding is the negative aspect of cart use. Now an increasing number of farms are seeding through heaps with no burning and only limited weed emergence. Seeds tend to mulch and reduce to valuable humous with the rest of the residue. 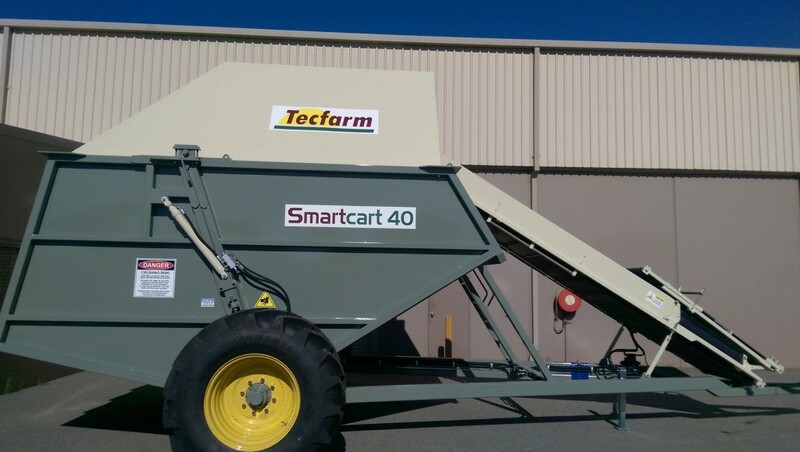 Tecfarm Smartcarts’ unique clamshell design enables control of heap height through the Smart Controller programming so they are well suited to seeding through heaps. Carts are quite cheap to run and capital cost is soon recovered by reduced chemical reliance. Baling straight from the harvester and hay cutting are options for some farms or on some paddocks. Good seed set control is achievable. The practice is limited by proximity to market for the low value straw or marketability for the hay and is quite depleting of soils as a high proportion of the seasons growth is removed. How to best approach the weed issue on each farm is an individual decision with many factors to consider. Overall management strategies will vary somewhat, farm to farm but good results are obtainable with a persistent approach. It’s good to gather as much information as possible via all sources such as Agronomists, AHRI ahri.uwa.edu.au/ and GRDC. Chemical history is very important but may not be known in detail, particularly for recently acquired land. Whether or not stock are involved is important. Narrow windrowing of residue is one of the cheapest harvest weed control options and can be effective within limitations of higher nutrient loss due to piling of straw for fuel and inefficient burning. A chaff cart is “low tech”, effective and can be used in all crop types, with less nutrient loss. It adds another level within the harvest operation though with modern carts there is very little maintenance and hassle. They deliver results, including a valuable feed resource. New technologies are being developed but it seems every system has limitations. An integrated approach where no one method is over relied on is best. If Harvest Weed Seed Control is decided upon, it is important to set up the combine to collect as much seed as practicable. Whether windrowing, carting or crushing, it is easy to miss a big proportion of seed if care is not given to setup. There are many owners of these systems achieving excellent results and happy to share information. Tecfarm can offer some advice and possibly Cart owner contacts. Give us a call anytime.